Earlier this year, the Blue Jays’ Chris Coghlan dove into home plate with the gracefulness of a swan. 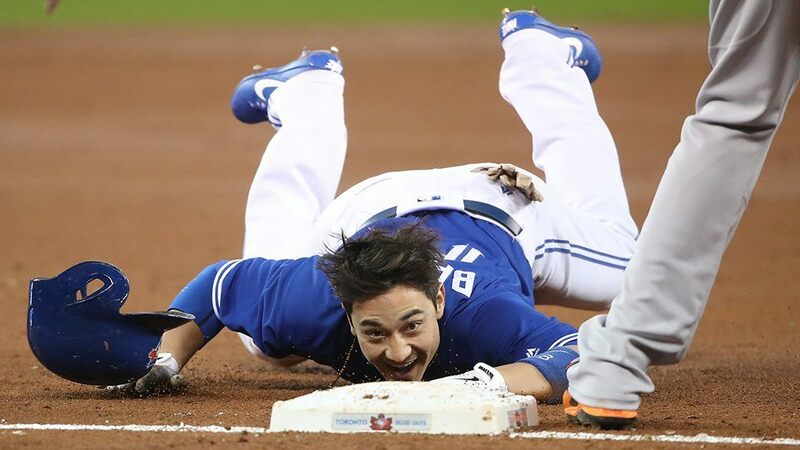 On the opposite end of the spectrum we have his teammate Darwin Barney, who slid into third base like a bull in a china shop on Monday. No, it may not have been the most elegant way to pick up an extra base, but Barney did it in style. The Blue Jays’ utility man had his very own highlight reel moment during the Blue Jays/Orioles contest as he attempted to stretch a routine double into a triple. He was ultimately successful in his goal to pick up an extra 90 feet on the base path, but his first attempt was only about 83 feet and he had to “swim” the rest of the way. That slide was so bad, it was good. Barney literally looked like a fish out of water. Although he tripped and fell going into his slide, Barney managed to propel himself forward and use a pseudo swimming motion to make it the rest of the way. Incredibly, Barney beat the ball and was safe on the play. And when he got back to the dugout, Barney had quite the fish tale to tell to his teammates. The Blue Jays’ playoff aspirations may be long gone, but moments like these provide a bit of humour for fans. Maybe next time Barney should work a bit more on his footwork … and his front stroke.